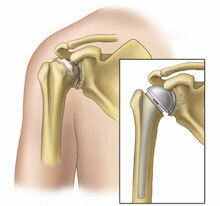 Shoulder joint replacement is performed on patients with a damaged joint. This surgery helps to create a new joint surface by replacing the ends of bones in a damaged joint. Shoulder joint replacements are done for the patients with severe arthritis of the joint shoulder.If you have these symptoms and signs of the disease you should consult a doctor at the earliest and have the treatment. Degenerative joint disease (osteoarthritis): Osteoarthritis is one of the most common forms of arthritis. The cartilage present in the shoulder that act as a cushion for bone movement wears away and causes painful and stiff shoulder. It is very common among people above the age of 50 years. But, can be rarely seen in younger people too. Even though the exact cause that leads to the development of osteoarthritis still remains unknown to the researchers. They believe that, it may be the result of molecular and mechanical events in the affected joint. There are no other way to prevent osteoarthritis and which is why people have to undergo for shoulder replacement surgeries. Other measures such as physical therapy, weight control and other medications can only be used to get relief from the symptoms and to improve the functioning of shoulder. When blood flow to bone joints greatly decreases, bone cells may die causing joint destruction and arthritis. This may lead to tiny breaks in the bone and may eventually lead to collapse. Avascular necrosis may also develop with excessive alcohol intake and long-term use of high-dose steroid medications. This condition can affect people of any age group, but is more common among people between the age group of 30-60. Men are said to be at more risk than women to get avascular necrosis. Rotator Cuff Tear Arthropathy: Arthropathy is the degeneration of the load bearing portion of the joint. When a crack occurs in the rotator cuff (associated tendons and sinews that reach up the shoulder joint), arthropathy could happen. This arthropathy can contribute to cartilage destruction. It is one of the complex and severe forms of shoulder arthritis. As a result, the joint may lose tendons that help shoulder for positioning and joint power. Severe fractures: A sudden breaking of the upper portion can end up with a severe fracture. Pitting this broken pieces back to their original position is an impossible task. In these case the only option available for the patients is shoulder replacement. Aged osteoporosis patients are prone to such fractures. Total Shoulder Replacement : This is one of the typical kinds of total shoulder replacement. A highly polished metal and a plastic socket will be attached to a stem while replacing the arthritic joint surface during the surgery. The metal ball and the socket will be available in various sizes. They can be either "press fit" or cemented to the bone. Patients with bone-on-bone osteoarthritis and intact rotator cuff tendons are usually considered to be the good candidates for total shoulder replacement. Stemmed Hemiarthroplasty: Sometimes, your issues can be treated with only by replacing the ball. The procedure where only the ball is replaced is generally known as stemmed hemioplasty. In this procedure, the head of the humerus will be replaced with a metal ball and stem. This kind of surgery is mostly suggested when you have had a severe fracture in the humeral head. Even though there is a slight difference between total shoulder replacement and stemmed hemiarthroplasty, most of the surgeons suggest total shoulder replacement as the better one. Resurfacing Hemiarthroplasty : During this procedure, the joint surface of the humeral head will be replaced with a cap-like prosthesis. It does not use a stem. One of the main advantages of this procedure is that, it preserves the bone. It is also used as an alternative to the standard stemmed shoulder replacement for the patients with shoulder arthritis. It is mostly suggested for young individuals than others. It is considered to be easier and safer. In this procedure, the metal ball and socket are switched. A metal ball will be attached to the shoulder bone and a plastic socket to the upper arm bone. This will help people to relieve pain and the normal functioning of the shoulder can also be regained. During the shoulder replacement surgery, the surgeon first make a cut over the shoulder joint. This cut is meant to open up the area. The surgeon then remove top of upper arm which is called as humerus. The following process is to cement the new material head and stem into position. After that the surface area of the old socket is smoothened and the new one is placed. Then, the surgeon closes the incisions with sutures. So as to shield the wound from infections, the doctor could place a bandage over the wound. This surgical procedure may require one to three hours. After the surgery patient may need to stay back in the hospital for one to three days. During this time period, the patient may have physical therapy in order to the adjacent muscles from becoming tight. Patient needs to be in support of sling for 2-6 weeks. At this stage, patient is not allowed to do any active movements. Four to six months is the usual length of recovery period of shoulder replacement surgery. The new shoulder can last long as 10 years. Any operation can cause the usual dangers and complications such as infection, blood clotting and bleeding.